Amid the excitement of this year’s Rugby World Cup celebrations in the UK, festivities of a different kind were also taking place. 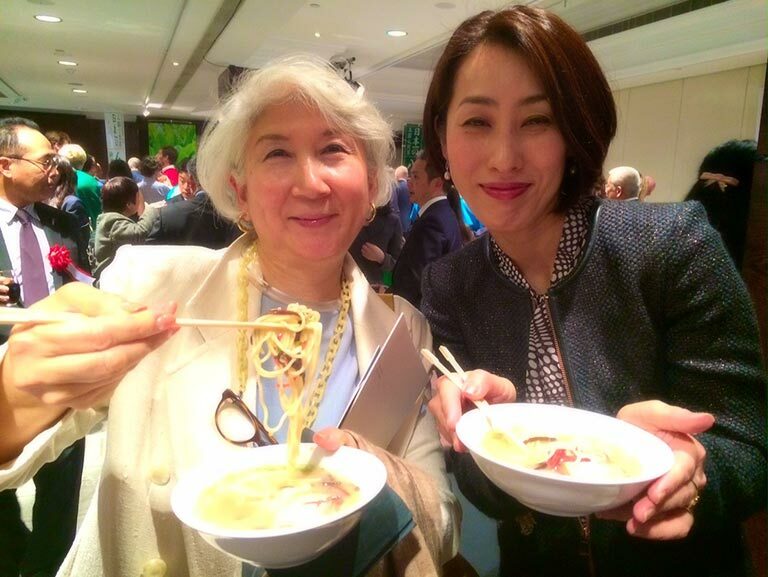 In a bid to showcase Fukuoka prefecture’s regional charm and delights abroad, Governor Hiroshi Ogawa hosted an evening of warm and vibrant hospitality at the Intercontinental Hotel, Park Lane. 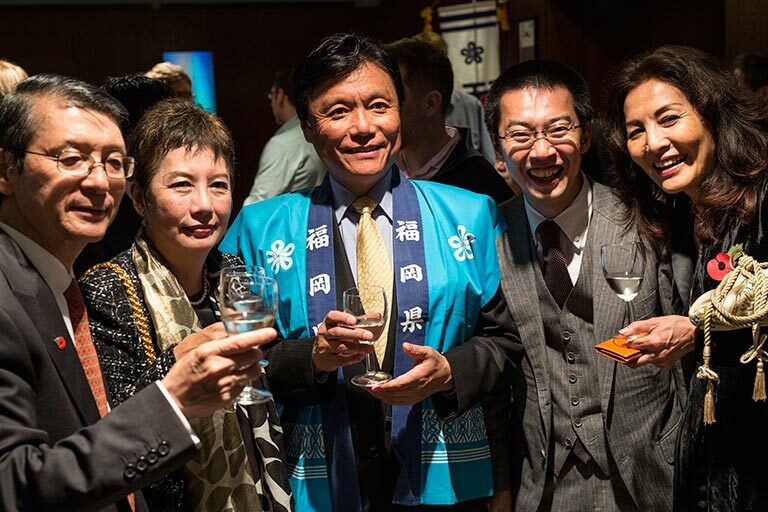 The grand ballroom was filled with joyous laughter and conversation, as guests were continuously delighted by the evening’s unfolding agenda, including local delicacies, dancing, music and of course, sake! 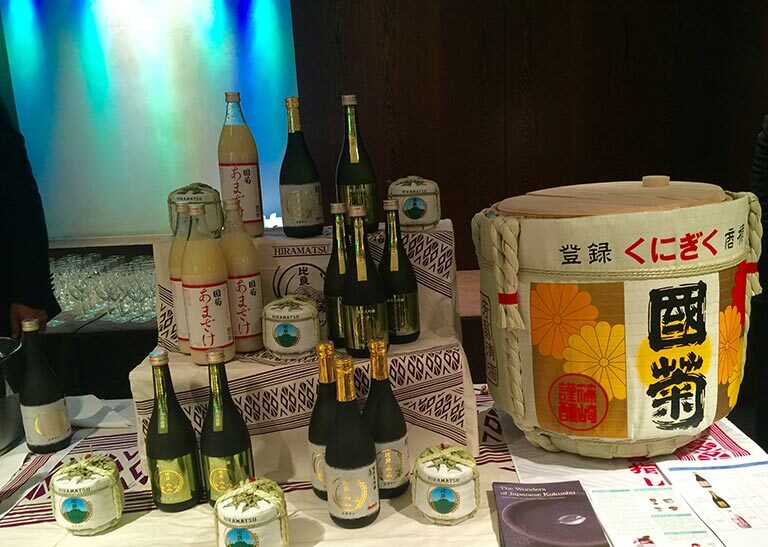 Twelve sakes from Fukuoka were served in total, including the IWC 2013 champion sake, Daiginjo Kitaya. 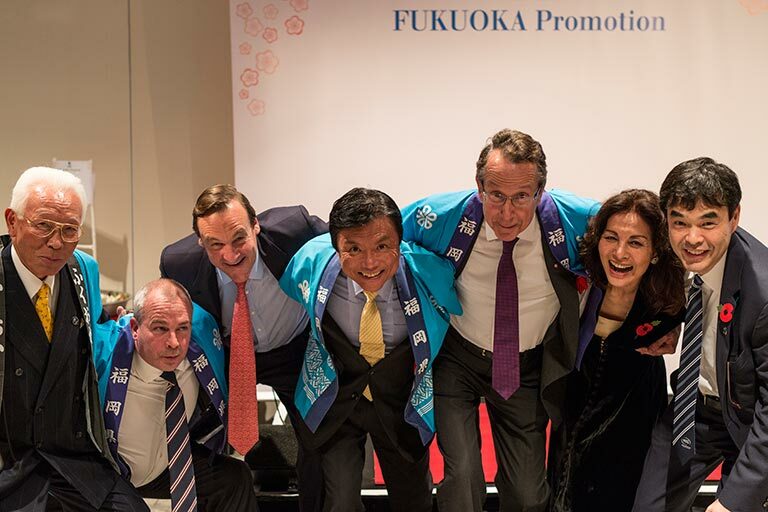 Fukuoka is situated on the southernmost island of Japan, Kyushu, where sake is described as Hojun Umakuchi. It is richer, more opulent and voluptuous than its northern cousins, retaining the body to both stand out against and compliment the local southern cuisine. 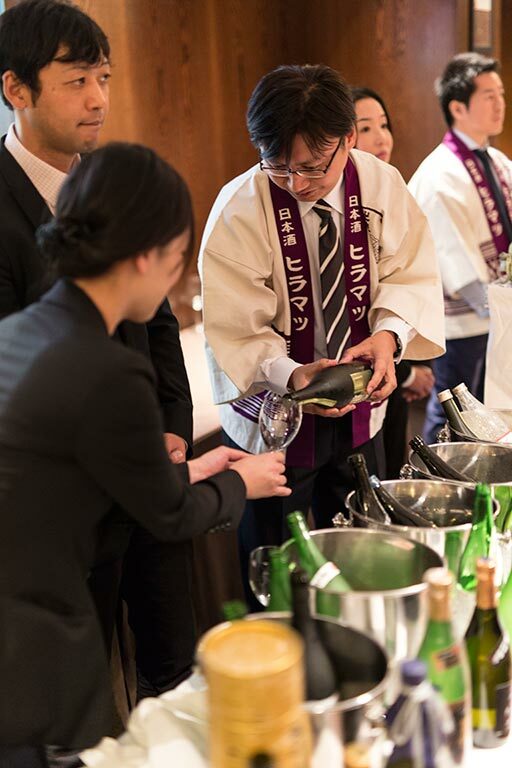 In addition, guests were given the opportunity to sample more diverse styles, from fresh and dry ginjos, to a famous plum sake made for the 1000- year-old Dazaifu Tenmangu shrine. This last was presented to each guest as an evocative souvenir of the evening. 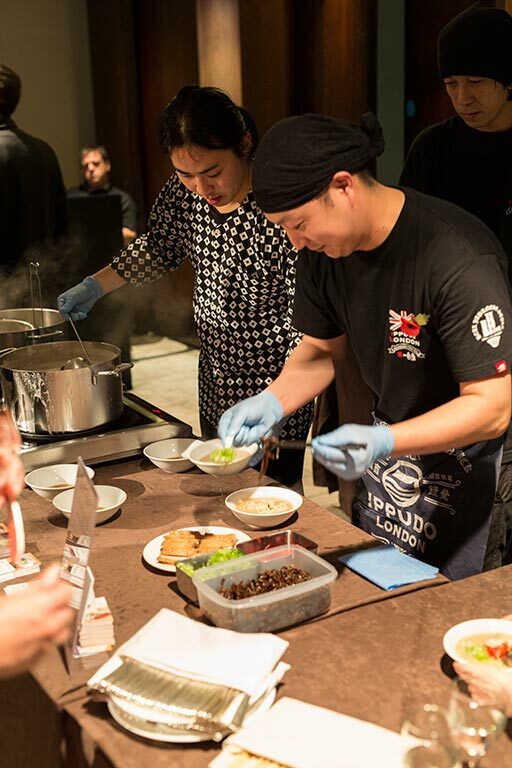 No guest left hungry that evening, after grazing through the buffet of local Fukuoka flavour, including hot bowls of Hakata Tonkotsu ramen prepared by Ippudo, freshly made sushi, Yame green tea with Japanese sweets, and onigiri rice balls made with Fukuoka rice. Poignant Japanese traditional dancing to the sound of Japan’s iconic koto finished the evening, turning the event into a true feast for the five senses. With a population of over five million, Fukuoka Prefecture is Japan’s fourth largest metropolitan area. 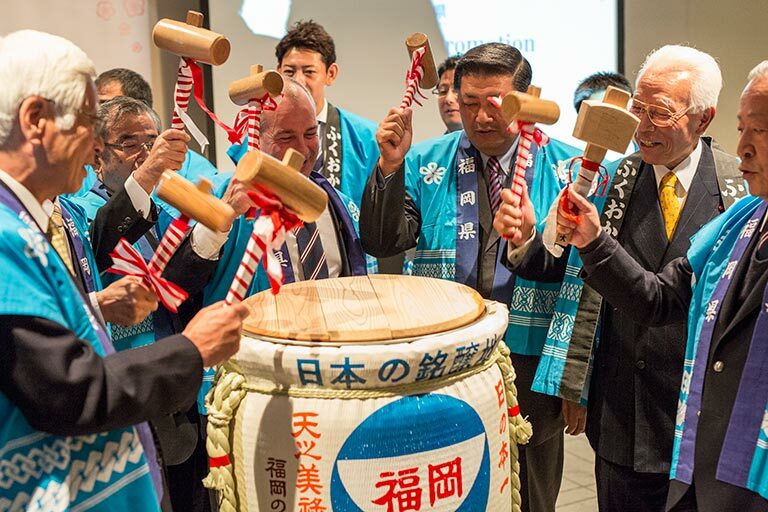 Its economic strength rivals that of Singapore, and the prefecture serves as the industrial and cultural hub of Western Japan. One of Fukuoka’s charms is the harmony between its urban life and nature. 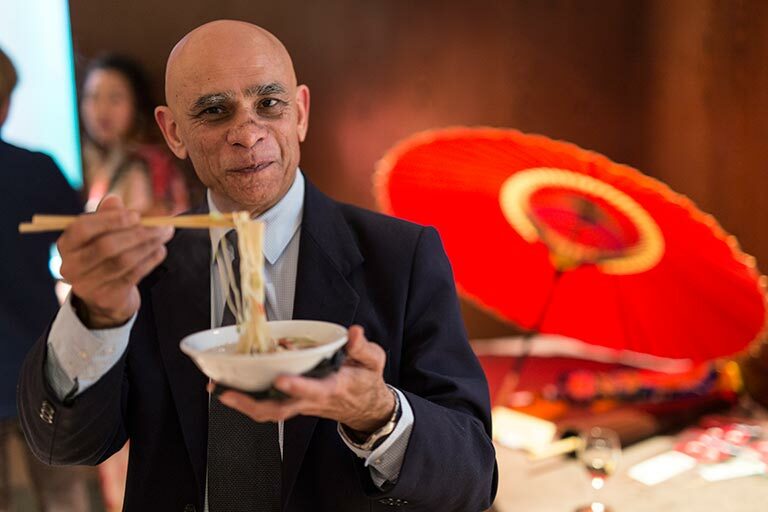 Seasonal delicacies and stunning views can be enjoyed even in the bustling city. Fukuoka City has also been highly praised for its compact features, ranking 10th in Monocle Magazine’s 2014 World’s 25 Most Liveable Cities Index. 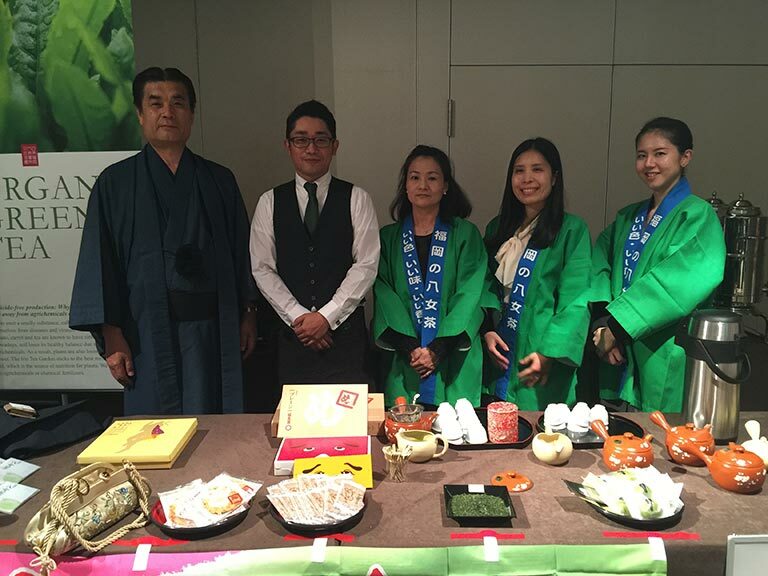 Our thanks to sake experts Honami Matsumoto and Masayuki Shozaki for their support on the evening.